Been working on a portrait of Zaha Hadid since she died last year. She was one of my biggest inspirations for architecture and art. Here's a short video I put together of the process of me adding some gold leaf to her portrait. Some of the stylistic elements in this artwork include designs from the 1000 Museum building in Miami. After 4 years of actively working and living in my art studio in Wynwood Miami, I had to let it go this past December right before Art Basel 2016. For an artist the act of creating art can be very complicated. Many things have to be sacrificed in order to create, for me it was a reasonable living situation. The warehouse converted space was called Viophilia a word that described the obsession with art. We built the walls, we painted, we invited collaboration and in the end only the memories that were documented remained. For years the derelict warehouse was home to loud underground ska parties, urban art pushers, a vintage pin-up model photo studio, a skate ramp, a colony of mice and at last a place where artists could envision a space and create interactive art installations, exhibits and even musical performances. While the space sometimes took the best of me with many sleepless nights from the police sirens roaring loud outside my window, it also took the best of my work and allowed me the time to focus intensely on my craft. I met many new artists, embarked on a new path creating murals with an amazing partner and also attended the funeral wake of a local artist who was also struggling to make it in art. I look at space in a whole new light now, for it is not the space or location that makes development happen, but the people who inhabit that space that can make that space vibrate with life. For now, Viophilia rests in peace, as a temple of creativity and its ruins lay scattered upon that concrete floor. I thank all those that made it what it was by giving their time and helping to make it what it was. My latest inspiration comes from the young goddess women on Patan in Nepal. The tradition is based on the ideal that pre-pubescent girls considered to be the earthly manifestations of divine female energy, incarnations of the goddess known as Taleju, the Nepalese name for Durga.2 Selected as children, they live in temples, are carried in chariots during festivals and are worshipped by thousands of Hindus and Buddhists. Excited to announce my interview with The Woven Tale Press Literary and Fine Arts Magazine. Link to interview can be found here. Ivette Cabrera is a Nicaraguan-born artist currently residing in Wynwood Miami, Florida. She migrated to the United States with her mother and siblings at the age of three to escape the Sandinista Revolution. She studied Interior Architecture and Design at the Academy of Art University and Marketing at Columbia College in Chicago. 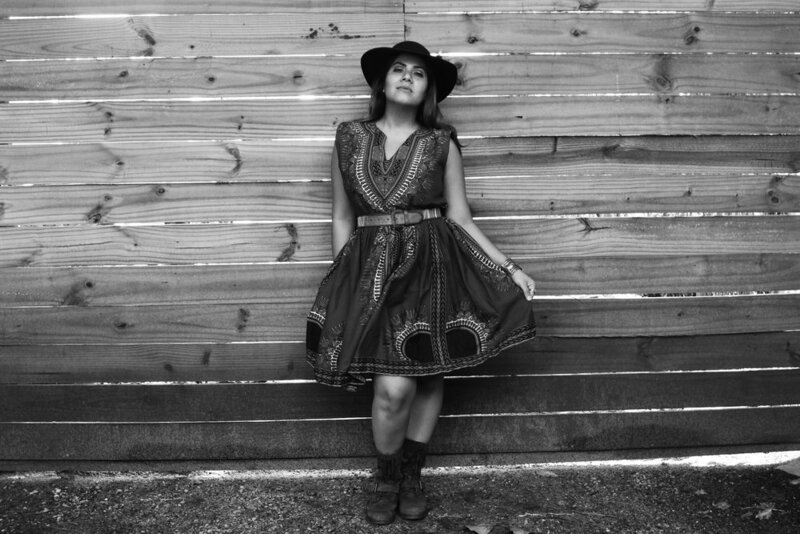 She started an art collective and artist residency in Wynwood in 2012 called Viophilia as an artistic sanctuary for artists to work intensively on their craft. She has curated numerous art shows as well as worked on various projects, including site renderings, interior renovations, and public art murals, as well as designing and constructing a house in Nicaragua. Her work has been part of numerous exhibitions, displayed at the Baker Museum in Naples, Florida, and is part of numerous private collections. Jaeger: Your drawings appearing in this month’s issue are part of a larger series featuring portraits of women adorned with fantastical, decorative crowns. What was the impetus for this project? Cabrera: I wanted to portray women from different cultural backgrounds embracing their own inner power and strength. Every woman is born wearing a crown because she can accomplish anything. As a society we should not only honor beauty but also welcome the powerful role that all women have. Society often has preset barriers and roles that are placed upon women, especially those from certain backgrounds. My work is an attempt to highlight and then break down those barriers so that any woman can see herself as potent and influential like the women in my art: women who wear crowns. Jaeger: How did you choose your subjects for this series? Cabrera: The subjects for my work are women from various cultures. My research has led me to find important women who changed the course of history, sometimes by creating rituals to glorify certain women or by breaking all cultural barriers in a society that devalued their worth. As a woman, I feel that its important to represent and tell their story. In visual art, it is both important to convey powerful messages to the viewer and to represent a beauty which entices the viewer to search deeper. The subjects of my work are beautiful women. But what makes them beautiful is how we see the power of their presence reflected back at us. Jaeger: In this series, you use a limited palette of color and composition; each portrait contains only a single woman, from the neck up, wearing a crown. Why did you choose to limit your palette? Cabrera: I chose to limit my palette because I felt that less was more. I wanted the viewer to focus on the details within each piece with minimal distractions. Jaeger: Who are some of the artists who have helped inspire this series or your work at large? Cabrera: My biggest inspirations have been the architect Zaha Hadid, along with Charles Rennie Mackintosh, Frank Lloyd Wright, and Erte. Jaeger: “Into the Light” stands out for your unique placement of the subject and the expressive gesture of her neck. Could you talk about the role of the subject’s gesture as well as her facial expression in the composition of this piece? And in the series overall? Cabrera: “Into the Light” was inspired by the independent film Nena, directed by my friend Christi Arce. The movie follows a young girl who is molested by her father until she finally breaks free and moves on to a brighter future. My piece explores the concept of moving forward in life despite past circumstances. In the drawing, the woman faces the sun—the light. Her headdress is taller than before because she overcame the trials and tribulations of something young girls have experienced throughout the world. It was crucial to show her resilience—how resilient all women can be—so while the gesture of her head is strong, her face is gentle and at peace. “Into the Light” is also part of another series I’ve been working on called Sacred Spring, based on the Ver Sacrum magazine (1898-1903) of the Vienna Secession, which explored new styles of art outside of academic restrictions. Jaeger: All the portraits are fascinating meldings of realistic features with the more conceptual of the crowns. Can you talk about this, especially as you seem to have done quite a bit of purely conceptual drawings outside of this series? Cabrera: Abstract work has a way of opening up the imagination. I wanted to incorporate this element into my drawings while also refining and showcasing my skills in portraiture. The juxtaposition of these two styles is meant to create contrast. The abstract forms I draw in the crowns are actually very detailed: I use a magnifying glass to continually add depth to the work. I had to teach myself how to draw the more “realistic” figures outside of my architectural studies. It has been a big challenge to learn how to draw realistically, but it is essential to development of my message and how serious I am about it. I couldn’t just make everything abstract. I wanted people to value that there were more complex layers to what I was trying to achieve, so I had to prove that I could draw and have an understanding of the complexities of realism. Jaeger: Previously, you studied Interior Architecture and Design at the Academy of Art University. How did you come to pursue this series, and from that background? Cabrera: Studying at the Academy showed me how to transfer my own style into a functional structure. At first, I spent many hours and long nights drafting, trying to achieve perfection in my work. It’s a rigorous process when you are designing elements of a building. However, as I began to focus on Cultural Studies, I learned more about issues that women where dealing with around the world. Soon I felt that architecture could only supplement my artistic process. To fully embrace and raise awareness about the topics I was exploring, I needed a new medium. That led me to an exploration of drawings that blended architecture’s technical aspects with a more expressive form. Jaeger: How has your background in architecture influenced your artistic process? Cabrera: My background in architecture has taught me to simplify structures into lines and forms, make use of negative space, and allow the viewer to take a journey through the structure. Odd shapes are always welcomed as long as they are in harmony with the overall composition and provide balance. I tend to look at architectural sketches of buildings to see how they utilize lines, curves, and forms. I also use a lot of the methods of drawing that I learned while drafting. For example, when I studied Interior Architecture and Design, we were taught to roll the pencil as we draw to make an absolutely perfect line and to make sure each line has a perfect start and end to it. Sometimes you also have to go over the start and end points of a line just a bit to achieve that solid look of the line. These subtle details makes the work look complete. Jaeger: The crowns are constructed from a combination of architectural, geometric, and seemingly ecological imagery. How did you come to incorporate this third element? Cabrera: I lived in my art studio at the edge of Wynwood, Miami for a long time. The space was a converted-concrete, derelict warehouse in a pretty bad neighborhood. When I finally moved out to a small cottage with a yard, I began gardening and experienced nature in a new light. The way that a bird builds its nest, the caterpillars on their way to transformation, and the monarch butterflies that visited the garden relate to the special cycle of life that exists all around us. We are all in a process of transformation because that’s how nature works. My experiences with the natural world inspired a new series, Monarch, that not only relates to the transformation of the individual but also to empowerment. I incorporated my studies of historical women with the elements represented in nature such as the cocoon, chrysalis, nest, etc. Jaeger: How might your experience drawing this series perhaps influence your work in architecture? Cabrera: My experience in drawing Monarch has led me to explore the forms in nature that can exist as architectural structures. I feel that when we embrace the nature that exists around us, we create a harmonious relationship with it. Enclosing structures actually creates a barrier to the environment. When I designed a house in Nicaragua, my priority was to open the house up to its surroundings. I created an interior courtyard open to the sky, allowed for wind to pass through the house, and also designed an interior garden that could be viewed from many angles within the home. Jaeger: You also have made a foray into public art, with some quite dynamic aura works. How did this come about? In particular, the mural depicting one of these actual portraits? Cabrera: The end goal for me has always been to express my message to as many women and people as possible. Public art is a beautiful way to expose art to many people who aren’t accustomed to going to a gallery or a museum. I remember once a whole school bus of children passed by while I was working. All of the children were screaming and shouting about how beautiful it was. A family passing by even asked about the mural. It’s essential for artists to take part in exposing art to those who cannot access it because the opportunities afforded through exposure can change the whole course of a person’s life. Jaeger: You write, “I want women to question their own identity so the headdress art is abstract, showing that every woman wears a crown.” Could you talk more about why your choice to make the headdress art abstract causes women to question their identity? Cabrera: If I were to depict a purely realistic crown or headdress then the viewer would only associate the crowns with those who have worn them in the past. However, if I allow the abstract forms to shine through, the viewer can use their imagination and begin to create their own associations with crowns. I hope the viewer will imagine themselves wearing the crown and that this process will lead them to ask themselves where they come from, who they are, what brought them here, how they view themselves, where are they going, can they one day make their own crown? Once we’ve been empowered by the idea that each of us wears a royal crown or majestic headdress, the barriers of our existence cease to exist. We can accomplish anything we put our love and work into. Very honored to be featured in Mount Gay Rum's United in Craft series that featured some behind the scenes shot of me working on art and my Mural team The Color Dreamers. The exhibition culminates in our annual Fine Art Auction which consists of a silent auction, a live auction, a “Quick Draw,” and cocktails and heavy hors d’oeuvres, all within the beautiful background created by the museum’s spacious galleries. The auction begins Saturday, March 4, 2017 at 5 p.m. and features a catered dinner and dessert buffet. The Live Auction bidding begins at 7:30 p.m. and will include a raffle drawing. Advance tickets to the Art Auction event last year was $95 per person and $105 at the door. Archival ink, marker, graphite, and charcoal on toned paper. Exhibited at Baker Museum in Naples Florida 2014. Currently at Silent Art Auction 49 for Yellowstone Art Museum on March 4, 2017. “Into the Light” was inspired by the independent film Nena, directed by my friend Christi Arce. The movie follows a young girl who is molested by her father until she finally breaks free and moves on to a brighter future. My piece explores the concept of moving forward in life despite past circumstances. In the drawing, the woman faces the sun—the light. Her headdress is taller than before because she overcame the trials and tribulations of something young girls have experienced throughout the world. It was crucial to show her resilience—how resilient all women can be—so while the gesture of her head is strong, her face is gentle and at peace. If you want to find women that are doing big things in the art world, keep an eye out for these artists in Miami during Art Week. Women struggle to get ahead in every industry, and the art world is no different. But this year's Miami Art Week offers a showcase of up and coming feminine talent that should be on your radar right now. Whether you’re an ardent feminist or simply someone looking to discover important art, follow our guide on the women to watch for at this year’s Art Basel and Miami Art Week. 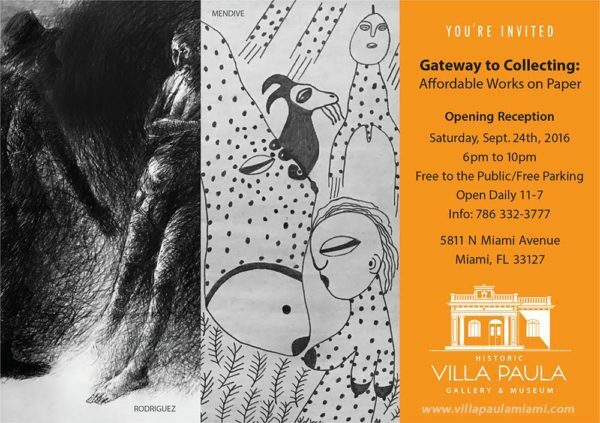 Viophilia, an art collective and gallery started by three local women artists (Ivette Cabrera, Francy Freixas, and Natalia Molina), will be open and exhibiting works by their residents (many of which are also women) during Art Basel. The studio will also be working with Viu Gallery on a special exhibition Friday, Dec. 2nd from 9-10 p.m. Ms. Cabrera (one of Viophilia’s directors) will also be showcasing some of her work at the Art Beat Miami Satellite Fair. Excited to announce that my artwork will be featured in The Woven Tale Press for their December issue! The publication is a 13 year old publication with world wide distribution and a large network or artists, collectors and gallerist's. Mount Gay Rum United in Craft commercial spotlighting my art coming soon! The last few weeks have been great! Not only have I moved my studio but I have been creating a new mural and shooting a commercial with Mount Gay Rum. Mount Gay Rum reached out to my partner and I for a national rum marketing campaign that focuses on my artwork and our murals for their #unitedincraft series. Their NYC and LA team came down to meet with us and their production team Stadium for a 2 day shoot. They treated us to a great storied supper at The Raleigh Hotel where they showed us how they perfect the craft of making their rum. Im very excited to see the final edit which will be released in 3 weeks. Here's some behind the scenes pictures of the production team filming and the mural located in Wynwood which I created with Amir Shakir for our team Color Dreamers . I will be posting the link to video once it airs. I was selected for Starry Night's "Artists to Look Out For" available December 2016 for Art Basel Miami. I'll be posting the link soon! Exhibit at Villa Paula: Guide to Collecting Affordable Works on Paper. Showcasing great Latin American Artists from Wilfredo Lam to Roberto Fabelo. Adaptation "A portfolio of Biological Futursim"
A solo exhibition of the drawings of artist Judith Berk King curated by Ivette Cabrera. Viophilia is pleased to present Adaptation : A Portfolio of Biological Futurism, a solo exhibition of new works by artist Judith Berk King. Translated from the Journal of Biological Discovery, many years in the future: For millions of years, the earth has been undergoing a series of ‘extinctions’ as unsuccessful species have died out, their niches overwhelmed by successful contenders. We are currently undergoing a Sixth Extinction, and animals and plants will have to evolve quickly in order to survive. 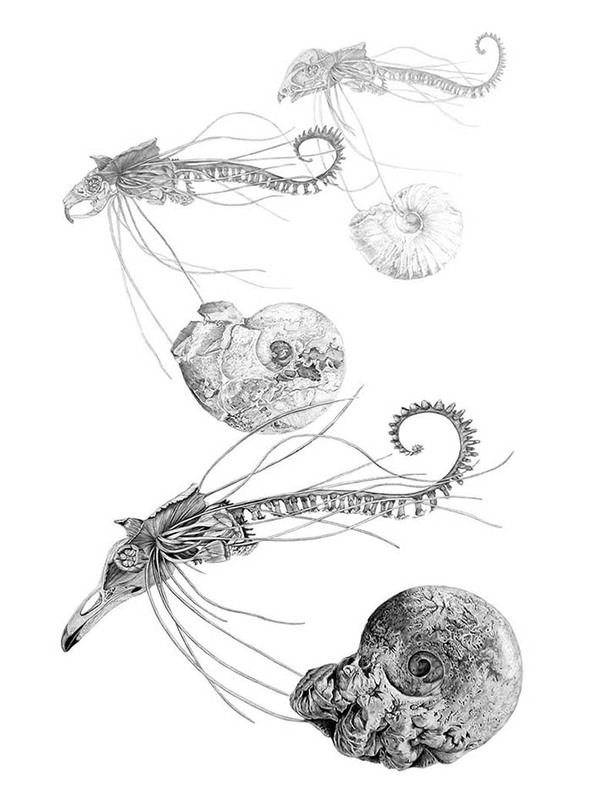 The drawings here represent a sample of species that might develop in response to our rapidly evolving ecosystems, or that might be created by deliberate hybridization and forced mutation. "Scientific specimens presented by museums in their glass cases and the artistic renderings of previous eras have always fascinated me. The displays and drawings enabled me to enter a place where strange objects, transformed by preservation and dissection, were brought into the light of day. 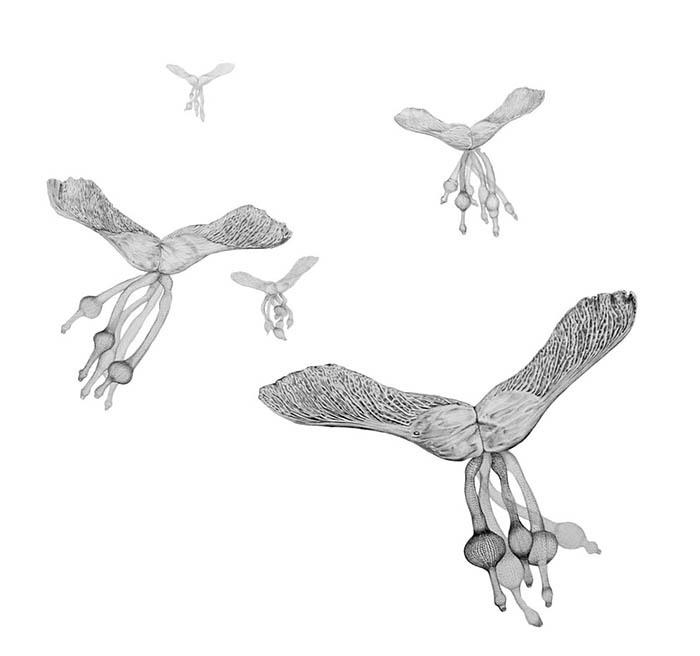 As an artist, I focus on the creation and display of curious zoological and botanical structures. The objects constructed may live somewhere in the present or may exist in the future. The style of the work may be contemporary or recall the work of scientific illustrators of the past, transcending time. Through re-imagination and distortion, I invite the viewer to examine and interpret the ambiguous and sometimes disquieting forms that inhabit these works." About the Artist: Judith Berk King lives and works in Miami, Florida. She studied fine art at Kensington and Chelsea College in London, England and received her MFA from Miami International University of Art & Design. She has attended residencies at the Hambidge Center for the Creative Arts and Sciences and Watershed Center for the Ceramic Arts. Her drawings and ceramic work has been published in books and periodicals, and she been exhibited in London, New York, Los Angeles and Fuping, China, as well as a number of other national and international venues. We invite you to take a special journey to a time in the future where we explore the past mutations of biological creatures that existed on this planetlong ago and have now become extinct. My newly finished Zaha Hadid art! Zaha Hadid is one of the major inspirations for my art. I have been a fan of her artowrk and creative spirit since I came across her architecture as a young adult. 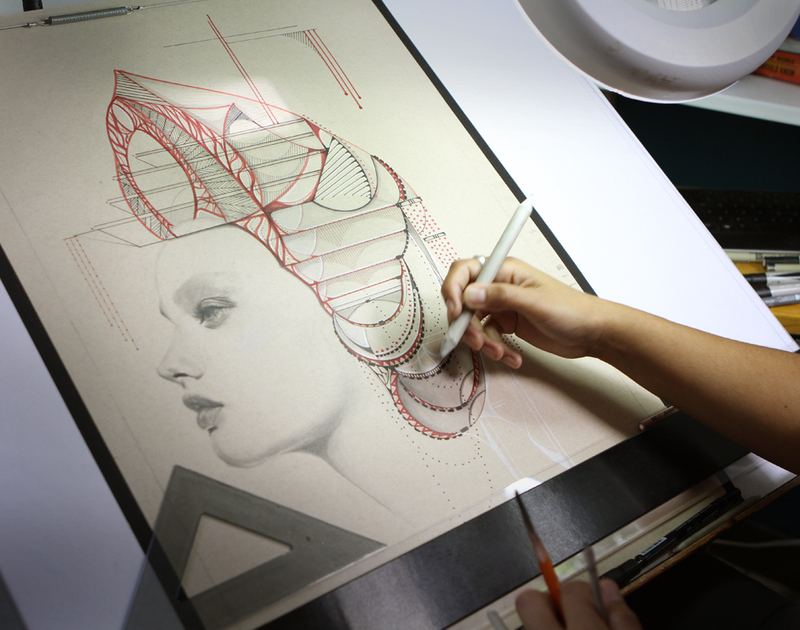 The lines and asymetrical forms in her work can be seen through some of the white lines I project in my pieces. The digital photo does not do the artwork justice, but hopefully it will be on display in its proper place soon. Thank you so much for bringing me the confidence to aspire to be as great as you, Zaha Hadid. I was really hoping to meet you one day. Rest in power Queen! The world of architecture has an empty space without you. You can check out the rest of my art here. I was selected as artist of the month by Nomad Tribe in Wynwood. A pop-up exhibition will be held with a few select pieces March 25, 2016. I completed my first art mural in Wynwood Arts District! It was a great feeling to be up high on the lift but very scary as it was swinging a bit from the wind. If you are looking for a Wynwood Mural Artist Feel free to contact me. Sitting here writing my blog post at about 6:21am not because I am up that early but because I sleep that late. The pursuit is endless and I cannot find the end to this path I am on. I search for the answers in my dreams hoping that they will reveal some memory as to why I cannot sleep. I imagine I was cursed at a young age to stay restless. So here we are once again chasing dreams hoping that once my eyes close I'll find that infinite paradise somewhere between the REM and the morning light. The sacred paradise that haunts our ambitions and holds on to tight to our waking life. When we will ever reach success when the day never meets the night. That late night that serenades thoughts of a passionate youth when time never seemed to fade away, now we find ourselves chasing light into the smokey distance with no end in sight. My pieces take a long time to create as I use a magnifying glass to work on the intricate details. This is my latest piece called Oracle which I've been working on in my studio. I sometimes battle between showing works in progress or not. I like to show completed works as I feel that the outcome has a better effect then seeing missing pieces that have yet to be completed. Even when I have studio visits I don't allow any photography of works in progress but today I'm feeling really good about the progress of Oracle so I decided to show a preview. This piece here is about 18" x 24" so its quite big. The hours put in so far are about over 50.